Men get exposed to lower back pain when they lift objects of heavy weight. Pelvic tilts will help you to strengthen and stretch your lower back. Hip extension helps build strength in the buttocks. Men get exposed to lower back pain when they lift objects of heavy weight, sleep in an uncomfortable position or are injured while playing sports. Strong lower back muscles help to prevent lower back strain, reduce any risk of injury and ease pain caused by chronic back ailments such as a disk disease or arthritis. It is indeed important for you to strengthen your lower back, though regrettably, most people undermine its importance and only work on the upper back. There are a variety of exercises that will strengthen the muscles in your lower back. Here is a guide. This is an easy exercise that will help you to strengthen and stretch your lower back. Lie in a horizontal position with hands on both sides and the knees bent. Now, tighten the buttocks, raise your hips and tilt the pelvis while pressing the upper back on the floor. Hold this position for 10 seconds and release and repeat. This exercise will help you to strengthen your lower back muscles. To start, lie on your back with the feet flat on the floor, knees bent and arms at your sides. Now, slowly raise your head and shoulders off the floor and try to reach for your knees. Hold this position for a few seconds and release and return to the first position. Try to make this exercise more challenging by crossing your arms over your chest. 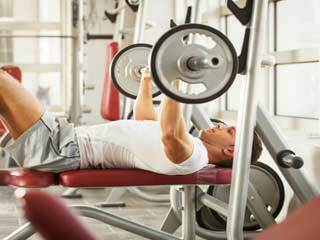 Start with a set of 10 repetitions and as you go on, remember to add more sets. A very popular exercise among gym goers, this is a lower back exercise that builds strength and increases flexibility. To do this exercise, you will have to use both your hands and knees. To start, place your hands and knees shoulder-width apart. Now, lift your right arm so that it points straight forward and while doing so raise your left leg and extend it straight backward. Make sure that the abdominal muscles are held tight and the lower back is held straight for about three to five seconds. Begin with 10 repetitions per set and then increase gradually. This exercise helps build strength in the buttocks and lower back. Use a chair so that you can maintain balance and then stand at a safe distance behind the chair. Bend forward and hold the back of the chair. Then, raise your left leg by keeping it straight and the toes pointed as you lift it behind you. Do not allow your body to move forward as you hold the position for one second before lowering the leg. Repeat the exercise with the other leg.